Hey guys...Very interesting reading here so I registered and wanted to say hello! I am a long time deer/elk hunter and somehow have always gravitated to the Leupold scopes. I do have a set of Nikon monarch 10x42 binos that I think are very nice. I have an FFL and have had for many years now so can get most scopes at dealer cost. The task at hand presently is topping my new .CZ 550 22-250 Kevlar HS stock with something nice. My friend whom bought the same rifle opted for the Leo #57180 which isa 30 mm tube 6.5-20x50mm. It was still pricey even at dealer cost. So I've been reading and reading and haven't really decided yet. Gun will be a PD, coyote eliminator! Any suggests appreciated! Chopping wood right now....out ...of ..breath. I don't know whats happening with the supply or the pricing right now due to the big sale SWFA is having. This looks to be a nice scope for what you are going to do. On a sporter barrel 22.250 I use a Burris Signature 3-12x44. I am happy with this scope both optically and size wise. On my heavy barreled 22.250 I have a Signature 6-24x44. I only use 24x from the bench but I don't have any PD's. Optically it is a good scope, comparable to my Leupold VariX-III's. It has a different "tint" leaning towards yellow. The Leupolds are more neutral with no tint. The light collector is broken now but the newer ones don't have that. A sunshade takes care of that, though. I would still go Nikon for the price. I don't know what your budget is, though. In the mid range pricing this is tough to beat. I have already bought two during this sale. They look good and have nice proportions physically. The optics are right there with the B&L I have, very clear. 22-250's claw extractor and set trigger, nice gun. I am looking for the best scope in the 400-500 range. I would definitely look at the Nikon, then. Hopefully when CT is done with that gum tree he will be back. He is THE Nikon man around here and is highly respected. Check this rig out. Thank you for the kind words, tahqua. The truth is, theres many knowledgeable folks on here that love to pitch in a help folks pick out optics. Tahqua included. I'm happy so far with the Monarch 6.5-20 w/ a lit Mil Dot on that .308. Eye relief is good, clicks are dead nuts and resolution is very nice. That said, the 5.5-16.5 Monarch that tahqua recommended would be a great choice and really more usable for PD's and coyotes, I would think. The high magnifacation scopes like mine have problems with a narrower FOV at high power and wicked mirage. Mines serving me well as a target scope. What reticle are you leaning toward? Mil dot...I think. Not sure how the BDC ret would be for PD's? How about a 5.5-16.5 w/ a BDC reticle?? Good write up on that reticle from the good folks at SWFA. Shooting shaving cream cans @ 200 yards?? That shaving cream can is about the size of a PD, no? That BDC reticle would be WICKED on coyotes too I believe. That is probably my top choice as of now. Great price too! Hey what about X.O.T.I.C. USS ??? Any good? Price? Is it available??? You cannot beat the SWFA Nikon sale in your price range. Agreed!!! That is a great price! Does anyone know anything about the XOTIC scopes? What price range are they in? Quality scope? Sounds like a BS warranty to me. At any rate I just ordered the Nikon this morning from SWFA. Their price was right at dealer cost and truly a great deal!!! Thanks to all you guys for your input! I will post a pic of my new Varmint rig when the scope gets here and I've got it all mounted up! Should be a real nice set up! SWFA is the distributor for the EXOTIC and you will be taken care of if something should go wrong with your scope. Your with the Good Hands (Optics) People. Have to say....Thanks for all the responces!!! The Nik 5.5-14 UCC is on back order...they said they will have more by the end of the month. I had a hold on a 6.5-20 Monarch and got it last week. Mounted it on my Rock River AR and shot tiny groups on Sunday. I use the term 'eyebox' to define how forgiving this scope is to find a clear, full view at full 20X....much better than any other scope I've used. BTW, HSM 223 ammo with match bullets is sublime. I was shooting Black Hills blue box and I think I like this ammo better. 52gr hp and 77gr hp is sub-MOA and cheap, $14 for 50rds of 52gr and $20 for the 77gr. I don't know if I could do better with handloads. Well I did think that this was correct.....Just found it available for even less than the already great price SWFA has! I am sure the SWFA guarantee is awesome, not knocking anything about it or SWFA. I got the same warrantee and the scope was "AVAILABLE" and the price was considerably less than the already great $302 SWFA price! That's all. I wouldn't do that to SWFA and I really doubt the 110% low price guarantee would apply for me. I have a Federal Firearms License and purchase all my items at wholesale from Jerry's Sport Center, one of the nation's largest wholesaler, if not the largest. Jerry's was out of stock that's why I was willing to buy it from SWFA, but it's on the way now from Jerry's. Just got off the phone with SWFA and ordered a 5.5-16.5 for my 22-250. They only had the Nokoplex in stock, the BDC would have been nice, but I really don't need it for the shootin I do. They said that there is another shipment of .5.x16.5 due in this Friday. I didn't want to wait and took the plex so it'll get here ASAP. My 12BGTV is dying to have a new set of glasses. Mine should be here by Tuesday. Got it in BDC ret. and got a set of Warne med matte rings for a CZ 550. UPS my local gun delivery just walked in my office with a brand new CZ 550 Kevlar HS stocked 22-250, VERY NICE rifle! 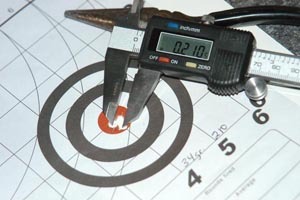 Test target shots can be covered with a quarter. Can't wait to take this one out and dial in some custom loads. Just wanted to say thanks to all that helped. I think I will be very happy with the Nikon scope! I also purchased a CZ 22-250 Kevlar HS stock last month. Mounted a 6-18 target leupold. I like this set up a lot. As you can see the photo attached a 3 shot group, the CZ is a fine shooting rifle. The load is Sierra 52 HPBT with 34gr. IMR 4064. seating depth is -10 off the lands. That's an awesome group!!! I hope mine will shoot the same! Thanks for the load data. My scope should arrive today!!! Glider man what is your overall length of this reload that is 10 thousandths off the lands??? Bang .... (silence) ... Pop goes the prairie dog.